Its been a busy few days as we've just completed moving house. We had a couple of guys and a van to do the heavy stuff but did all the small stuff by car which was slow and tedious but at least it went straight into its new home, so we don't have mountains of boxes to unpack. I'll tell you more later but in the meantime let me tell you about a recent visit. A couple of weeks back we took a trip to the Sunnylands Estate. For all you Brits, accustomed to the unique institute of the National Trust, this is the nearest similar experience in this area but is somewhat different. Tickets are timed and must be booked in advance. When we arrived we found that we would be guided round in small parties of just seven guests with a guide. In true American style we rode across the estate in a golf buggy - heaven forbid one should have to walk! Sadly the day we visited was one of the few grey rainy days here, so I took no photos and didn't visit the new desert garden. The pictures with this post are from the internet. I did however return to view the garden which is freely open and more about that in the next blog. 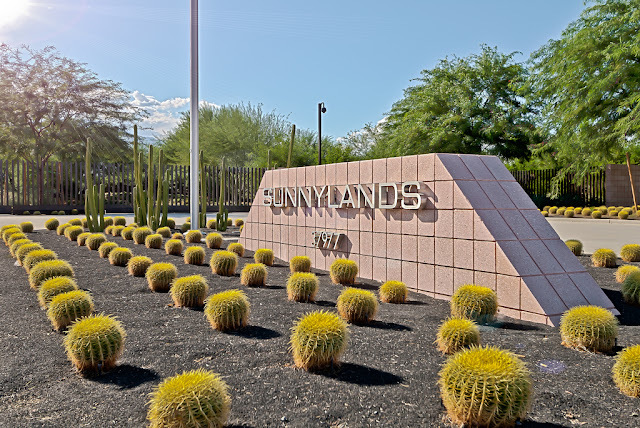 Sunnylands was owned by Walter and Leonore Annenberg and the estate was left after their deaths, to be opened to the public and used as a retreat centre. Walter Annenberg was at one point Ambassador to the United Kingdom, so lived in the residency in Regents Park. His fortune was raised through his publishing business. 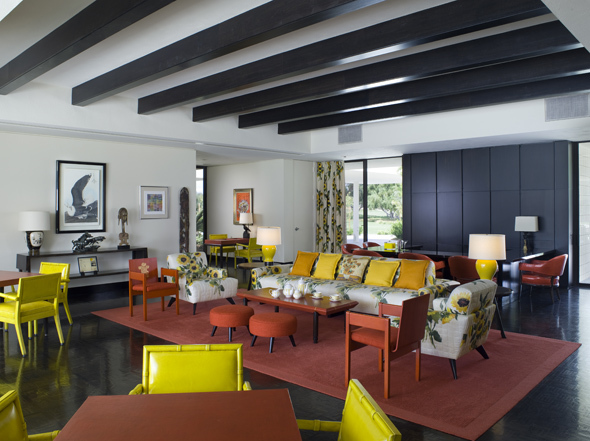 This house was designed by Quincy Jones and built in the 1960's to then fashionable mid century modern style. 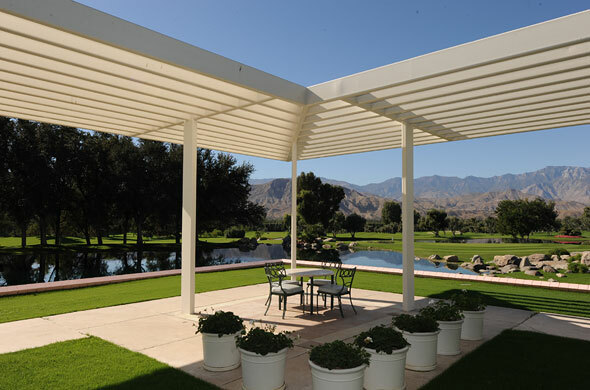 Jones' signature style incorporated a statement roof, together with huge windows but strong external overhangs to protect from the harsh summer sun. Inside, the house is both spacious and intimate, being divided into smaller spaces whilst still part of a wide open atrium. Heavy industrial steel beams are softened with pale green paint. 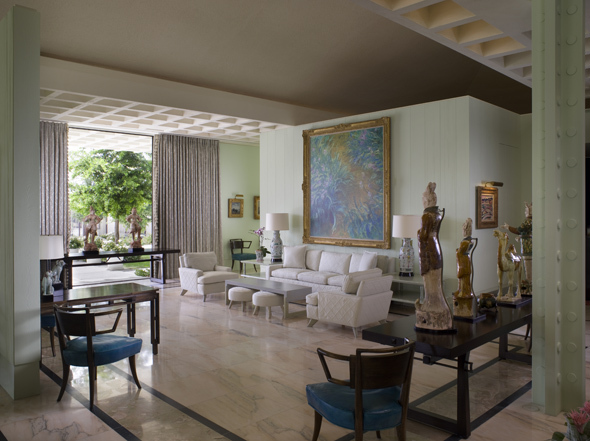 The whole house is filled with art, although these are now mostly reproductions as the originals were bequeathed to the Metropolitan Museum of Art in New York. 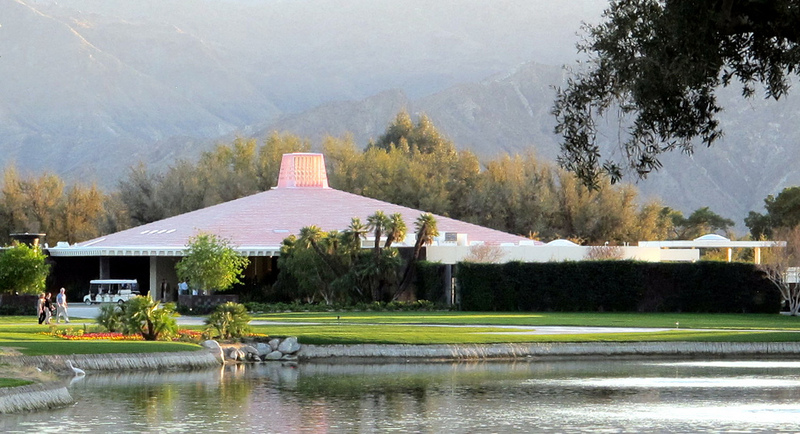 Many key figures of the 20th century were entertained as guests at Sunnylands. 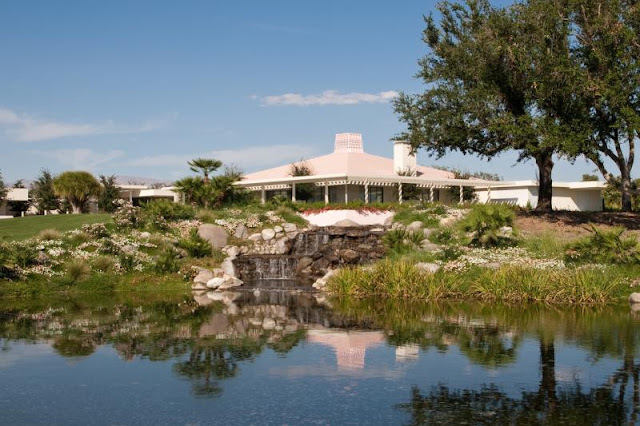 The list includes seven U.S. presidents, the British royal family, Margaret Thatcher and Hollywood icons like Bob Hope, Frank Sinatra, Jimmy Stewart, Ginger Rogers, and many others. The main house has only one master bedroom and guests were accommodated in an independent guest wing separated from the main house - great idea! Guest rooms are colour coded in case you get lost! There are some limited gardens around the house, including Walter's cactus garden and Leonore's rose garden. Pink bougainvillea lines the terrace. 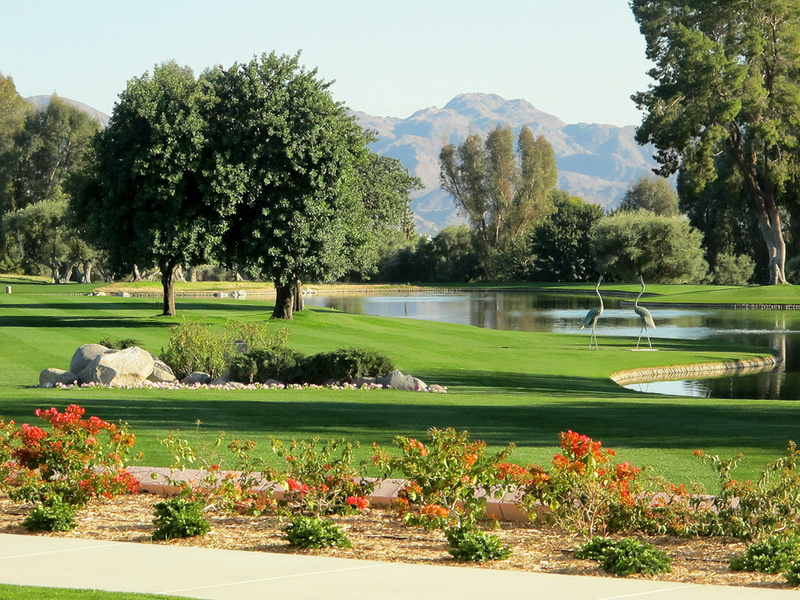 The majority of the estate is laid out as a nine hole golf course. Although there are thousands of trees in this lush landscape, there are only two palms, which are normally such a distinct feature of the desert landscape. The overall feel is therefore of a more temperate, almost English landscape. The two palm trees were given by Eisenhower, who said they had to have some! 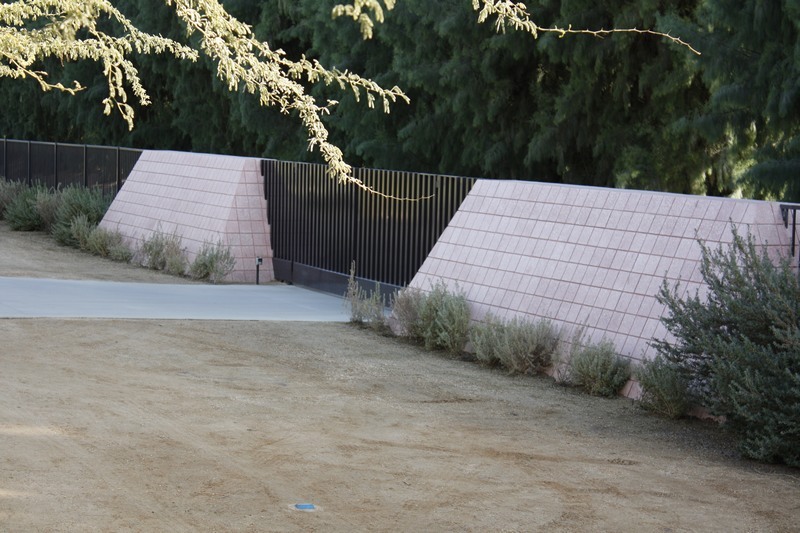 The estate is enclosed by an iconic pink wall. Apparently the boundary used to be marked by an extensive hedge of pink oleander until the onset of oleander wilt disease which devastated the hedge. With the imminent arrival of an important guest, the wall was painted a soft pink! A wonderful smart new Visitor centre welcomes guests to this experience but it has one major failing - the tea room. With my mouth watering, I anticipated coffee and cakes after our visit but found there were just a few tired muffins wrapped in cling film on offer. National Trust it isn't! Hi Ian, glad to hear you have finally moved and have a new home! Moving homes can be very stressful but it seems it went smoothly for you both. That's a great looking place to visit, both satisfying landscape and interior design lovers! Not sure about the shape of the roof, but the grounds surrounding the property are absolutely gorgeous. I love the colorful retro décor in second photo of the interior. I think that style would even go nicely in an apartment. Would’ve been nice to see more pictures of the inside of the house. If you ever get the chance to visit this place again, I do hope you’re able to post more!